This year, I’ve been using this great free meal planner found at #4 on this post – High Five for Getting Organized! – from kelly’s kinda crazy. 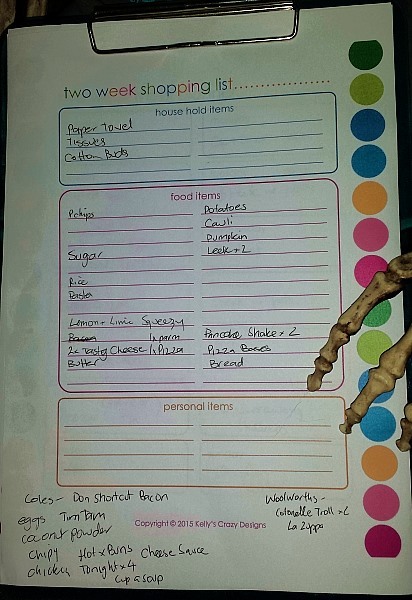 The meal planner comes with a grocery list – Above you see Carter – my trusty skeleton friend – holding it. I’m thinking from now on he will get to hold the grocery list each fortnight so if I need to add something he will remind me to add it when I walk past. :) Here is a closer view with this fortnights shopping on it. I also sit down with my laptop and the shopping list and go through the Coles and Woolworths brochures and write down any items which are on special that we need to stock up on. I’ve been doing this for so long now that in general we never run out of things that we regularly use. I’m loving the cute design of the meal planner. 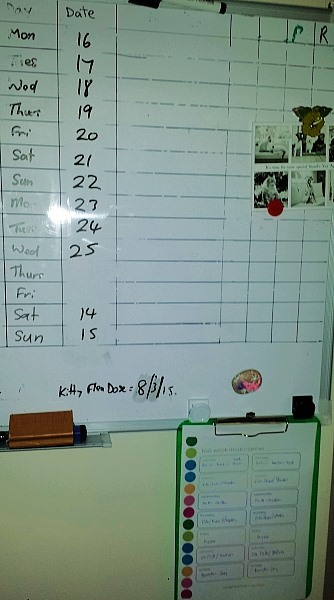 I used to do meal planning on my whiteboard which was not so pretty, nor could I take it with me to other rooms of the house which, on occasion especially when writing the shopping list, was mildly inconvenient. It also means I can keep copies of the old meal plans on the clipboard and review them when making the next meal plan. This way, I tend to notice meals we have not had for a while and add them back in. Just be aware the file prints out an entire year worth of meal planning – you can choose to print just one or two pages at a time but you’d have to do it manually. I printed mine out at the start of the year and I’ll have enough to last until the end of this year.. This meal planner runs fortnightly and so we have been planning our menu fortnightly and shopping fortnightly as well, with just a quick stop at the shops on the second weekend if we need to pick up something fresh. Most of the time we don’t need to, because I am getting very good at planning meals which have the fresh ingredients closest to the shopping trip – and also very good at freezing things we need for later. 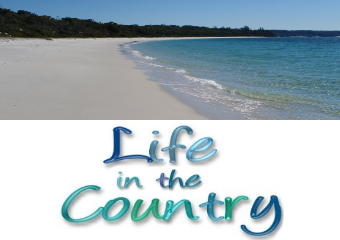 This past weekend we made our regular trip to Lenards at Warrawong which is roughly an hour or so drive from here, depending which way you go. We took a little detour past Albion Park to catch a glimpse of the Grand Old Lady VH-OJA at the HARS museum. If it wasn’t too busy we would have stopped to get out and take some photos, but as expected the place was absolutely packed and we just drove past. So, my apologies, I have no pics of that for you. I also have no pics of Chicken Young Lad who has served us on our past 3-4 trips and who is starting to remember that we are the Crazy Bulk Buying People. Even so, after each item he asks “Anything else today” and we’re all.. YEP, give us 4 of those and 8 of those. 1. 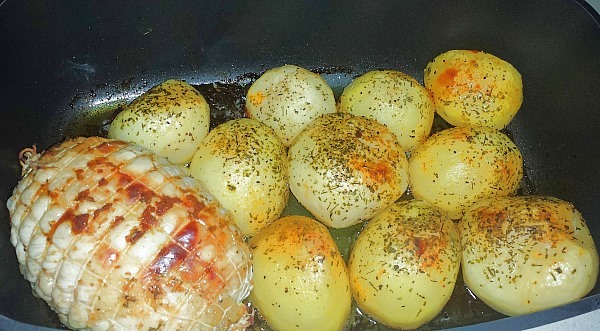 It is super expensive to buy pre-prepared chicken here eg kievs & filos. 2. Even though it was super expensive to buy, none of the local options tasted anywhere near as good as the options from Lenards did. 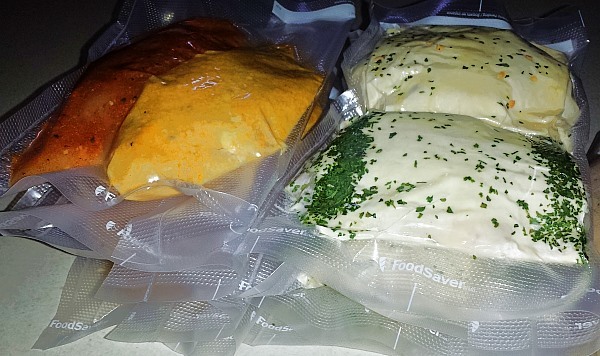 The red chicken breasts that you see paired in the foodsaver packets with Chicken Kievs are the pocketed breast with baby spinach, dill, fetta and ricotta. They are my favourite – so tasty! I don’t mind a chicken kiev, either, but I deeply love these little red thingies. We also stopped in at Dan Murphys and bought enough cask wine for cooking to last the next 6 months or so. I use Banrock Station Cabernet Merlot and Sauvignon Blanc for cooking and they are routinely $5 or so more expensive locally so if I need them and we’re already up Shellharbour way, I like to stock up. If you enjoyed reading this, you might want to take a look at this post – some things I know for sure about grocery shopping. I used to meal plan, but since I retired I’ve let that fall by the wayside, especially this last summer when I didn’t feel like cooking, or didn’t know what I wanted to eat, so I’ve been eating randomly. Over the summer I put on 5kg!! mostly icecream is the cause I suspect, but with winter coming on I need to start meal planning again and drop that 5kg, because not only do my jeans not button, there is a 5 inch gap across the waistband, no hope at all of getting that button into the buttonhole! 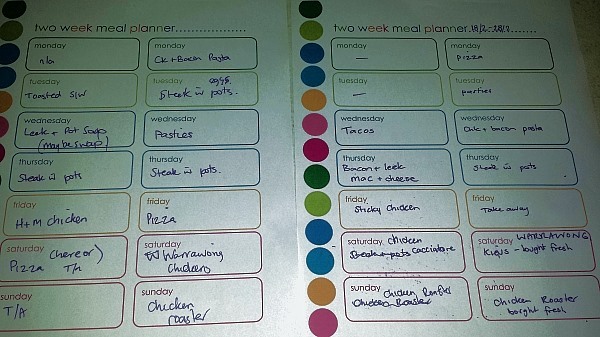 I’ll dig out my old laminated shopping list and see if I can find my meal planner sheet, also laminated. Write on with whiteboard marker and wipe off ready for the next week. Meal planning really is something we should do. I am THE WORST PERSON EVER for not meal planning.